Sweden’s court decision to overturn the expulsion of a Palestinian convicted of firebombing a local Synagogue has provoked a fierce reaction from Israel and pro-Jewish groups that called it a legitimization of anti-Semitism. The Court of Appeals for Western Sweden has overruled another court’s decision concerning a deportation of a Palestinian man, who was earlier convicted of staging an arson attack on a synagogue in the city of Gothenburg. The man was sentenced to two years and prison and expulsion over what was classified as a hate crime, the Swedish media reported. While upholding the prison sentence, the court of appeals still said that, since the perpetrator could be “perceived as a threat to other Jews” and Israel “might have an interest in the matter,”Sweden “cannot secure the man’s fundamental human rights” in case of his deportation to Palestine. The convicted Palestinian has been previously granted asylum in the Nordic country. The decision immediately provoked angry response from some Israeli officials. 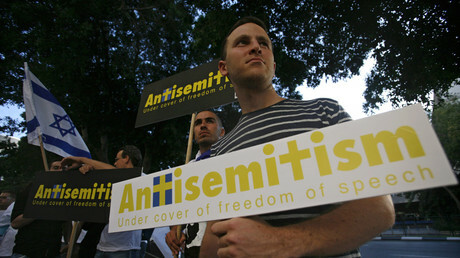 Some Swedish and international pro-Jewish organizations also joined the wave of outrage sparked by the court’s decision. Maria Halkiewicz, chairman of the Sweden-Israel Friendship Association office in Stockholm told the Swedish Nyheter Idag newspaper that the Jews in Sweden are already concerned about the anti-Semitism in the Swedish society and the latest development only further contributes to this fear. “The fact that such a man gets to stay in Sweden on the grounds that he is guilty of crimes against Jews is really hard to grasp. It is bizarre that anti-Semitism can save a criminal from expulsion,”Halkiewicz said. The nationalist Sweden Democrats Party also contributed to the outpouring of criticism as it apparently pursued its own goals. “A great political signal: ‘Are you a Palestinian worried about being expelled [from Sweden]? Attack some Jews and stay…”an MP and the Sweden Democrats’ spokesperson on migration, Paula Bieler, said in a Twitter post. “This is an offensive moral outrage rewarding … anti-Semitism and criminal behavior,” the WJC CEO, Robert Singer, said, commenting on the matter. The US-based pro-Jewish Anti-Defamation League (ADL) also slammed the verdict as an openly anti-Semitic and discriminative act. “Swedish community tells us: Had the Palestinian thrown a firebomb in the street, he would have been deported. Because he targeted a synagogue, he won’t be. The court cares more about attacking Israel than protecting Jewish community of Sweden,” Jonathan Greenblatt, the former Special Assistant to the former US President Barack Obama and the ADL CEO, said in a tweet. The convicted Palestinian, whose name was not revealed by the Swedish authorities, was one of a dozen of people, who threw Molotov cocktails and firebombs at a synagogue in Gothenburg back on December 9, 2017. The incident resulted in no casualties, although a group of Jewish teenagers, who were attending a celebration in the building, had to briefly take shelter in the synagogue cellar. The man was later arrested and convicted of a hate crime alongside with two other assailants, who were identified as a Syrian and a stateless man of Palestinian descent. The Palestinian, however, was the only one, who was due to be deported as the other two had Swedish residence permits. The attack on the synagogue took place just three days after the US President Donald Trump officially recognized Jerusalem as the capital of Israel, sparking massive anti-Israeli and anti-American protests that erupted across the Muslim world. Israel then launched a brutal crackdown on the protesters in the Occupied Territories. Around a dozen Palestinians have been killed and hundreds injured as Israeli security forces violently suppressed demonstrators in Jerusalem, the West Bank and Gaza. Sweden, meanwhile, has been the first EU member in the western Europe to officially recognize the State of Palestine back in 2014.